There has been a rise in popularity of Scandinavian crime fiction as more and more novels are being translated into English, and not without good reason. Helene Tursten's Inspector Irene Huss novels set a good example of a series that deserves praise and attention. 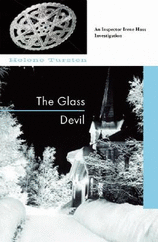 The Glass Devil is the fourth in the series featuring Detective Inspector Irene Huss. Set in Sweden, the novel opens with the murder of a family: a schoolteacher and his parents, a well-respected rector and his wife. Criminal Superintendent Sven Andersson had been asked by his cousin to check on the recently divorced teacher who was showing signs of depression. He takes along Detective Inspector Huss, expecting the worst. What they find is not the suicide they expected but rather a cold-blooded murder. To complicate matters, upon an attempt to notify the parents of the deceased, police discover the rector and his wife dead in their bed, both shot to death in a similar manner as their son. The only clues left at the crime scenes are upside-down pentagrams drawn in blood on the computer screens and an upturned cross on the wall of the rector's bedroom. Could the murders be related to the rector and his son’s research into local satanic cult activity, or something entirely different? As law enforcement begins the arduous investigation into the murders, they seem to hit dead end after dead end. A sprinkling of clues along the way is all that propels the investigation forward. Inspector Huss travels to England in an effort to learn more from the last surviving family member, the rector's daughter, Rebecka. She is ill with depression, much like her mother had been, and unable to offer much in the way of help. Rebecka’s employer and doctor are very protective of her, creating yet one more obstacle the inspector must deal with. Irene Huss is a strong female lead. An older woman, one of two female inspectors in her office, she is fit and more than capable. Tursten strikes a nice balance between the inspector's work and personal life. As the mother of twin daughters who recently turned 18 and a husband who has a demanding job if his own, she has much to juggle in her life. Tursten does a good job of showing the realities of such a struggle, including the compromises that sometimes must be made. Personal and work lives are not the only things being juggled throughout the novel. Irene Huss and her colleagues have their hands full, often short-staffed and with other cases to investigate. The author captures the necessity of teamwork in the law enforcement world, whether it be staff from the same office working together or connecting with other authorities outside of the district or even abroad. Review copy provided by Curled Up With a Good Book. I'm still amazed that there is a whole world of series out there that I haven't explored (and I read ALOT of series!). Back in my pre-blogging days, series made up probably 80% of my reading. This one sounds good. Have you read the others? Are you happy with all of them? Sandy - This is the first Tursten book I've read (3rd in the series, I believe). I do want to go back and read the first two books in the series. In fact, I bought a copy of the first in the series not that long ago. Hmm, very interesting. I've just dipped my toe into Scandinavian (and other European translated) crime fiction) but I'm finding it very compelling. Will keep this in mind. Thanks! It is interesting that there seems to be a lot of Scandinavian crime fiction out there - that genre must be popular there. This one sounds good - a pat ending wouldn't bother me. I'm a big fan of scandinavian crime fiction and always on the look out for more writers to try. I actually do have her first book so I need to move it up on my reading queue - this sounds very good. Nicola - I really enjoy the Scandinavian authors I have read so far. There's quite a few of them out there right now! Kathy - And it's definitely growing in popularity here in the U.S.
Stacy - Haha! I don't blame you. Iliana - I would love to know what you think of the first book in the series when you get to it, Iliana. Wow, this one sounds good. I will have to look for this series. The Scandanavian stuff in translation is getting better and better. I'm off to order this one now. Thanks for the review. Sharon - I hope you will give it a try! C.B. - I just discovered on the Scandinavian Crime Fiction blog that Soho won't be publishing any of the future books in the series (in English). I do hope someone else will pick these up so we can read beyond the first three books in the series. Alice - I hope you will enjoy it if you read it.